Wagons are 4-wheeled carts that are used for multiple purposes. There are many different kinds of wagons. Covered wagons are basic wagons that have a tarp that covers it. Horse-drawn wagons are pulled by horses. Finally, hand wagons are pulled by hand. Making your own wagon is a fairly simple project that is made easier by the availability of wagon axel kits. 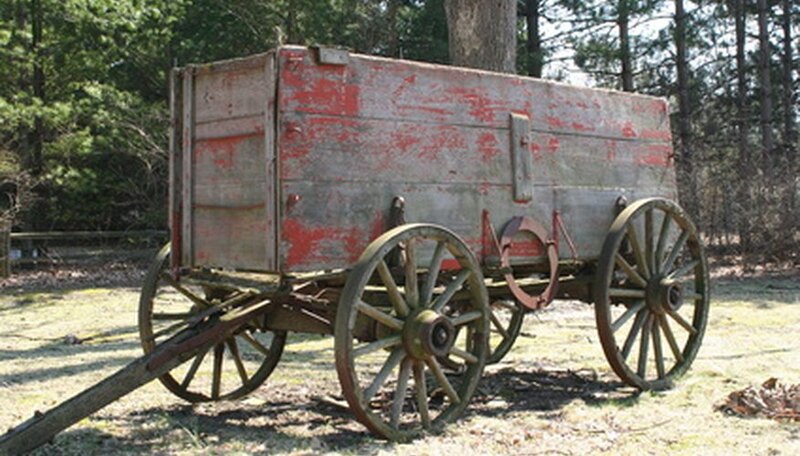 A homemade wooden wagon could be used as a toy or as a handy way of carrying things. Cut a plywood board so that it is 3-feet long by 2-feet wide. Use a table saw to cut the board. Cut two plywood boards so they are 3-feet long by 1-foot wide. Cut two plywood boards so they are 2-feet long by 1-foot wide. Attach one of the 3x1 plywood boards to the 3x2 plywood board so that the two 3-foot edges meet at a 90 degree angle. Apply wood glue to the 3-foot edges and use a staple gun to attach the pieces together. Repeat this step with the remaining 3x1 on the opposite side. Attach one of the 2x1 plywood boards to the 3x2 plywood board in the same manner as the 3x1s were attached to the 3x2. Repeat this step with the remaining 2x1 on the opposite side. You should now have a wooden box that is 3-feet wide, 2-feet deep, and 1-foot high. Attach a pivoting wagon axel to one end of the wooden box. Use a wagon axel kit. Wagon axel kits can be purchased online and include: a wagon axel that pivots, a wagon handle, a fixed wagon axle, four wagon wheels, and all the screws needed to put the pieces together. Attach the handle from the wagon axel kit onto the pivoting wagon axel using the pieces provided by the kit. Attach the fixed wagon axel to the wooden box on the end opposite the pivoting wagon axel. Attach the wagon wheels to each end of the wagon axels using the pieces provided by the kit.